The search for new ways to bring people to the music is quite rightly under the spotlight elsewhere. In these difficult times finding new ways of taking music out of conventional performance spaces, and to the people is equally, if not more important. The photos here show one innovative solution which has attracted remarkably little attention. In the early 1970s maverick architect Louis Kahn designed a floating stage, in the form of a 195 foot long ocean-going boat named Point Counterpoint II, for Robert Austin Boudreau's American Wind Symphony Orchestra. 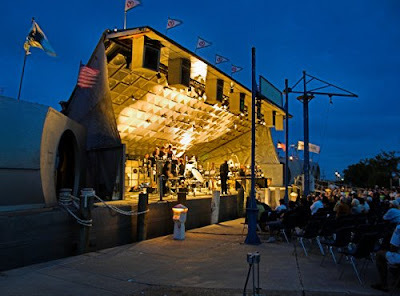 This replaced the ensemble's first floating performance space, a converted coal barge, which had been used since 1961. 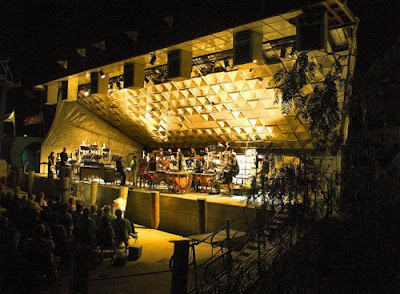 The orchestra of young musicians specialises in contemporary music and still uses the floating stage for concerts. Over 50 years the orchestra has commissioned more than 400 works from composers including Georges Auric, Leo Brower, William Bolcom, Alan Hovhaness, Colin McPhee, Krzysztof Penderecki, Joaquín Rodrigo, Ned Rorem and the black Nigerian composer Samuel Ekpe Akpabot. Point Counterpoint II features in the documentary film My Architect made by Nathaniel Kahn, the architects illegitimate son. As well as being an excellent film there are lots of musical references; in fact Louis Kahn seriously considered an alternative career as a composer. Kahn died in 1974, two years before his unique floating stage was completed. Robert Austin Boudreau, who is in the centre of the photo above, was born in 1927 and has announced his retirement from the American Wind Symphony Orchestra several times without success. Like Louis Kahn's, Boudreau's career has not been without controversy. It is reported that as well as being arrested for sailing his floating concert hall contrary to coastguard regulations, Boudreau has crossed swords with Pittsburgh's land-based musical establishment and has fallen foul of labour laws over the treatment of his musicians. Robert Austin Boudreau's innovative approach to commissioning new works and bringing music to the people has a remarkably low profile, at least on this side of the Atlantic. Additional information and observations from American, and other readers would be very welcome. Many thanks to Michael Martin for permission to use his superb photos which were taken South at Point Marina, Port Isabel, Texas. 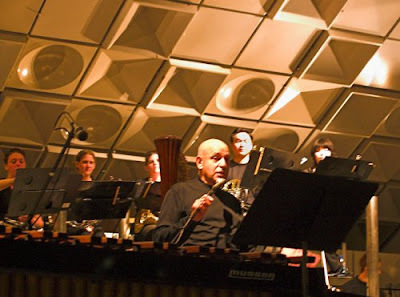 Listen to the American Wind Symphony Orchestra here. More on the links between music and architecture here. Pliable, while I don’t know whether I will ever perform in Los Angeles’s new elite Walt Disney Hall, I have performed in Frank Gehry’s much earlier (although expanded in the 1990s) Concord Pavilion located over the hills east of San Francisco. 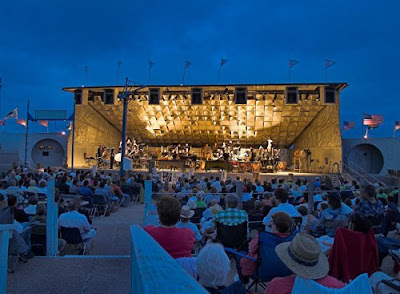 “The pavilion, which draws about 350,000 a year, has featured artists as varied as Frank Sinatra and Tom Petty, the Vienna Philharmonic and Red Army Chorus. More than 90,000 people attend the facility's wide range of free community events. The Concord Pavilion grew out of one such community event, the Concord Summer Festival. It was founded by the late Carl Jefferson, a Concord car dealer who began producing concerts with his favorite jazz musicians in the city's Boulevard Neighborhood Park in 1969. That year, Erroll Garner, Mel Torme, Carmen McRae and Buddy Rich were among the performers.